HYDERABAD: The Lok Satta on Monday announced its first list of 36 candidates to contest the 2009 Assembly elections, giving representation to 22 candidates belonging to ‘discriminated sections’, including women. The party also requested 27 nominees, including its State leaders, to enter the poll fray without selecting the constituencies. The list includes seven constituencies in the city. Releasing the list here, party president Jayaprakash Narayan said there were 11 businessmen, five each lawyers and doctors and three each housewives, from education-related fields and social activists. He stated that the candidates had been selected unanimously and where it was not possible, elected. The criteria for selection was ‘competence, leadership qualities and passion for service’. Dr. Narayan said the party welcomed public-spirited persons to contest on behalf of the Lok Satta. Replying to a question, he said the party had asked him to contest, but he was yet to decide whether he should contest for the Assembly or the Lok Sabha. The list of candidates is: Y. Rama Rao (L.B. 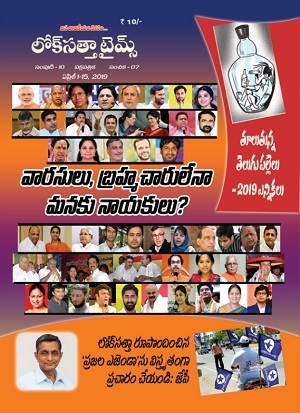 Nagar), K. Srinivas Rao (Seri Lingampally), N. Ravinder (Qutbullapur), Rohit Kumar (Musheerabad), Pratibha Rao (Jubilee Hills), Maharani (Secunderabad), A. Subhashini (Khairatabad), T. Annam Naidu (Amudalavalasa), D. Eshwar Rao (Gajapatinagaram), B. Appa Rao Babji (Vizianagaram), Biharilal (Gajuwaka ), G. Narayana (Anakapalli), K. Jayasri (Jaggampet), V.S. Kanchustambham (Prathipadu), K. Venkateswar Rao (Peddapuram), G. Janakirama Raju (Undi), U. Rajamani (Pamurru), K.V. Basaveswara Rao (Vijayawada East), Jnanamba (Vijayawada Central), Chennupati Vazir (Penumaluru), M. Bal Ranga Reddy (Giddaluru), Ch.Venkat Reddy (Markapuram), N. Sridhar (Nellore Town), K.V. 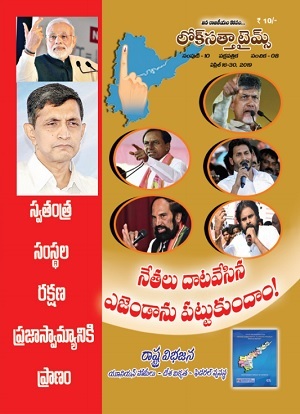 Krishnaiah (Gudur), M. Mallikarjuna (Palamner), Jagan Mohan Raj (Rajampet), K. Kondaiah (Anantapur Town), P. Srinivasa Rao (Tungaturti), K. Rajender (Suryapet), S. Raghavulu (Khammam), U. Narender (Wyra), P. Nageswar Rao (Paleru), P. K. Rama Rao (Warangal West), M. Saroja (Chennuru), M. Rama Reddy (Yellareddy).